We have updated our Freshbooks integration and we now support the all-new Freshbooks. If you are using Freshbooks Classic then nothing changes and you can keep using the integration with Breeze. Freshbooks is all-in-one small business invoicing and accounting solution. FreshBooks is accounting software that makes running your small business easy, fast and secure. It includes invoicing, expenses, time tracking, payments, reporting and more. For the integration to work you first need to authorize Breeze to send data to Freshbooks. You can find the steps in the next paragraph. After that, you can send all task and time entries to Freshbooks as draft invoices. Breeze creates a new dummy client named "Breeze Import" and the exported data is added as draft invoices. The invoice lines entries depend on the report type you run in Breeze. If you are using task reports then the lines on the invoice are tasks. If you are using time tracking reports then the lines on the invoice are time entries. You can then open the draft invoice in Freshbooks and change the client and any other details you wish. Before you can start using the integration you need to enable it. The integration is individual and needs to be enabled by every user who wishes to use it. Head over to your personal settings page and open the "Integrations" tab. Click on the "Enable Freshbooks integration" button. Now the integration is enabled. You won't be asked any credentials yet, they'll be asked when you start sending your data. To start sending your tasks and time entries to Freshbooks head over to the reports page. Choose your report type, set any filters and run the report. After that, you'll see the Freshbooks export button. Clicking on the button will redirect you to Freshbooks where you are asked to log in and authorize the integration. After you're redirected back to Breeze then your data is already sent to Freshbooks. Head over to Freshbooks and check your draft invoices. 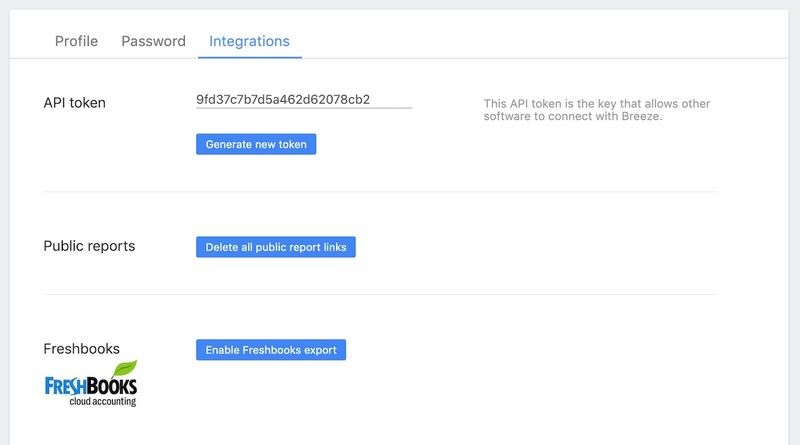 If you are using Freshbooks Classic at the moment and you have the integration enabled with Breeze then you need to disable the current integration for the new one to work. To do that you can just delete your Freshbooks API key and domain under your personal settings.